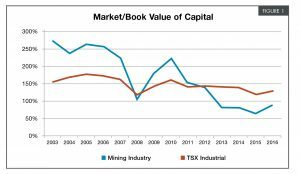 The Canadian mining industry has destroyed considerable shareholder wealth over the past decade. A cyclic drop in metals prices since 2011 worsened economic performance and challenged the viability of virtually all companies, with some not likely to remain intact. Attributing all of this economic damage solely to a drop in metals prices, however, is misguided. The mining industry has repeatedly proven to be a poor steward of invested capital, consistently producing returns below any reasonable estimate of the cost of capital and thereby destroying shareholder value and wealth. The principles of corporate finance suggest that an investment of higher risk should produce a higher return, such that on a risk-adjusted basis, return is roughly equivalent across investment opportunities over time. How the mining industry has continued to attract investment capital is somewhat surprising, given that the industry as a whole has produced, over the 2002 – 2015 time period, a mere 2.5% average return on capital when a reasonable estimate of an industry required return on capital, i.e. cost of capital, would be around 8-9%. Given the inherent risk and performance history of the industry, investors are undoubtedly questioning continued involvement, notwithstanding all of the positive talk of yet another future cyclic recovery. The general decline of the average industry market to book ratio, i.e. market value to book value of invested capital, implies that investors are increasingly discounting the business case for the mining industry beyond the ups and downs of the business cycle. Maintaining the interest of investors will require fundamental change in the industry. The existing business model needs to evolve towards one that emphasizes the centrality of the operating company (rather than the corporate office), where the managerial mindset is one of responsibility and accountability of ownership and decision making is focused on value creation. This transformation presents a tremendous opportunity to refocus organizational strategy and performance management on average rthe creation of value as measured by economic profit. This back to basics approach will improve economic performance and corporate governance, and, importantly, provide the industry with a good case for future investment as shareholder value and wealth is created. A review of the economic performance of the Canadian mining sector readily reveals the poor economics of the industry. More importantly, it illuminates characteristics of performance that are symptomatic of a flawed approach to business and financial management. When evaluating performance on the basis of operational profitability, i.e. net operating profit after taxes (NOPAT), the average Canadian mining company has, admirably, produced above average performance over the upside of the most recent commodity price cycle. While the strong operational profitability 2005 – 2012 was in part due to good product pricing, it is also fair to assume that competent operations management also played a major role. Given that conventional performance management systems in the mining industry are focused on the management of operational cost and/or profitability, it should be expected that during favourable points in the cycle, management is highly motivated to deliver operational profit given the opportunity to generate a performance bonus. However as suggested by Peter Drucker, the founder of modern management, “what gets measured, gets managed,” and presumably, what isn’t measured is mismanaged. While the intent of focusing management on operating profit seems sensible, it may prove costly to the extent that capital management is neglected or worse, abused. For instance, an initiative that increases operating profit by moving cost off the income statement and onto the balance sheet, i.e. automation replacing labour, is of no economic benefit if the total cost base is unchanged. A more unfortunate situation emerges, however, when a reduction in operating cost (and related increase in operating profit) is achieved by adding an even greater amount of capital cost to the business. If managerial focus were simply limited to operating profit, this perceived increase in business performance is illusionary, as the resultant increase in total cost would drive down economic profit and destroy value in spite of the fact that the business could be more profitable from an accounting perspective. Having managers focused on operating profit while shareholders are clearly concerned about economic profit is problematic, as it misaligns interest and rewards and generally results in weaker economic performance. In situations where capital is not systematically costed within the operational financial management, i.e. an EBITDA based system, capital may be managed as if it were free, leading to an accumulation of trapped non-productive assets that create deadweight cost to the business. This non-productive capital could appear as, for example, excess inventory of spare parts, idle plant and equipment, and/or large stockpiles of semi-processed ore inventory. With no cost attached to the usage of capital, capital intensity will increase, and productivity and return on invested capital will suffer. Fig. 3 clearly illustrates the high capital intensity, i.e. 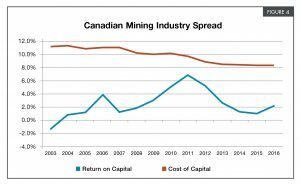 capital/revenue, of the mining industry relative to the average Canadian industrial company. Ironically, the most capital-intensive industries tend to bias performance management towards operational profitability at the expense of capital management and efficiency, when in fact these industries have large capital cost components that must be actively managed. The Canadian mining industry provides an excellent illustration of this situation. The industry is focused, from an operational standpoint, on metrics such as cash operating expenses, AISC, cash operating profit, EBITDA, etc. – measures that all commonly exclude any cost of employed capital. While capital investment decisions are typically made, ex ante, using credible corporate finance tools, i.e. net present value (NPV) of free cash flow models, the actual capital deployment and ongoing management decisions are governed by performance management systems that generally exclude the cost of employed capital. This exclusion has proven very costly to shareholders, as even during a period of high operational profitability (2005 – 2012), the high capital intensity and cap ital cost of the average mining company resulted in a return on capital consistently below that of the average Canadian industrial company and well below a reasonable estimate of the cost of capital to the mining industry, resulting in the destruction of a tremendous amount of shareholder value and wealth over the past decade. A value-based management solution Economic profit is the measure of value creation and the general term for a class of performance measurements that include economic value added (EVA), shareholder value added (SVA), economic value creation (EVC), and others. Economic profit is the measurement of value creation as the performance measurement reflects the total revenue and cost basis of a company. When a company’s total cost, i.e. operating and capital investment related costs, is subtracted from its total revenue, what is left over is pure or economic profit as all costs have been reflected and any surplus is value creation. While the adoption of economic profit may not guarantee industry-leading performance, it will ensure improved operational performance, health and profitability over time, as it introduces an approach to performance management that recognizes both operational profitability and capital efficiency. An economic profit-based management system is designed to better align the interests and rewards of managers and shareholders, effectively making managers think and act like business owners. The following graphic illustrates the enhanced view of a value based financial management system relative to a conventional EBITDA based approach. When a company generates positive economic profit, this implies that its return on capital, i.e. operating profit/capital, exceeds its cost of capital, and therefore the company is creating value. A negative economic profit implies the reverse – that value is being destroyed. Fig. 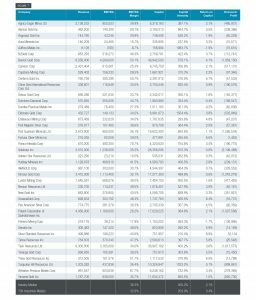 7 (page 51) presents 2016 year end performance for TSX listed mining companies. For purposes of illustration, a constant 8% cost of capital and 25% marginal tax rate (within the NOPAT calculation) have been used for all companies. In addition, non-recurring sources of income or expense have been excluded from the measurement of NOPAT and rather included as an element of capital to be amortized over time or on a per unit of production basis. By capitalizing and amortizing accounting-based asset writedowns, the performance measurement model is shifted from successful efforts to a full cost basis, as return on capital is computed based on all project efforts not just the good ones. This adjustment has a large effect on the computation of capital in the analysis, given the magnitude of asset writedowns in the industry between 2011 and 2015. All figures are presented in thousands of US dollars. Although virtually all companies reported positive EBITDA for 2016, very few are in fact generating positive economic profit and thereby creating shareholder value. 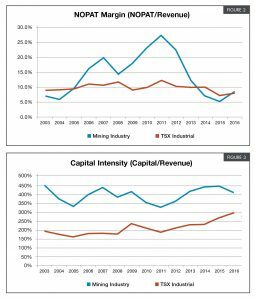 While the Canadian mining industry is producing a median level of EBITDA margin above that of the Canadian nonfinancial industrial sector (i.e. 36.4% for mining and 32.8% for all industries), the high level of capital intensity within the mining sector depresses its return on capital and economic profit. Without question, placing more focus on the management of capital with mining operations would improve capital efficiency and value creation, as a large amount of non-productive capital likely exists within the industry, and with the correct incentive, excess capital could be extracted and value generated at the margin. What is important to investors and managers is that economic profit is improving – ideally in a sustainable, continuous fashion. ❶ Improve the performance of your existing business by generating more operating profit form the capital that is currently employed. Growing revenue, improving productivity and operating cost management will increase return on capital, (i.e. operating profit/capital) and create value. ❷ Invest capital in value-creating opportunities as represented by new projects, products, customers and/or locations that will produce an anticipated return on capital above the cost of capital, on average and over time (i.e. the net present value of economic profit is expected to be positive). ❸ Proactively harvest capital from value destroying investments, and redeploy it in new opportunities where value creation is expected (or distribute the capital to investors via dividends, share buybacks or interest and principal payments on debt if no value-creating investments are available). ❹ Source capital as cheaply as possible to lower the weighted average cost of capital and hurdle for value creation. 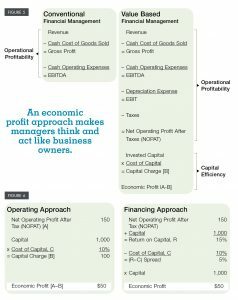 Economic profit is effectively normalized free cash flow, where the one-time (cash based) investment costs of a free cash flow model are converted into a series of periodic capital charges within the economic profit model. The net present value of economic profit equals the net present value of free cash flow, thereby allowing economic profit the joint benefit of being both a performance measurement and a strategic financial tool. If a company is expected to generate positive future economic profit in net present value terms, it should trade at a premium to its book value, and likewise if the company were expected to generate ongoing negative future economic profit, it would trade a discount to book value. This foundation principle of corporate finance, implies that increases in economic profit, over time, should drive increases in enterprise value and share price. 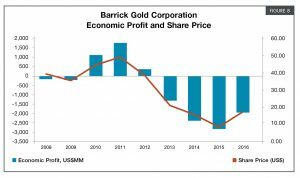 The example of Barrick (Fig. 8) clearly illustrates this relationship, with its recent restructuring and performance improvement program driving value creation and share price movement at the margin. This connection between the periodic creation of shareholder value, as represented by economic profit, and the generation of shareholder wealth, as represented by enterprise value and share price, means that companies can make use of economic profit for decision making with a high degree of confidence. In essence, all economic business decisions are made in the interest of driving economic profit upwards over time, obviously with the requirement that a business be managed in a responsible and ethical manner. Linking managerial incentive compensation to the improvement in economic profit ensures that capital investment is managed throughout the business, as unwise capital spending would then be costly to shareholders and managers alike. Recognizing that what gets measured gets managed clearly illustrates the importance of getting the design of a business management system right. Given that you generally get what you pay for, focusing management on the delivery of economic profit is the surest path towards delivering shareholder value from within Canada’s mining industry. Mack Ferguson is a managing partner at Arche Value Management. He has more than 25 years of professional consulting experience in applied corporate finance and business economics. He can be reached at mferguson@archevaluemanagement.com or 416-848-7794. Are miners game for virtual reality?